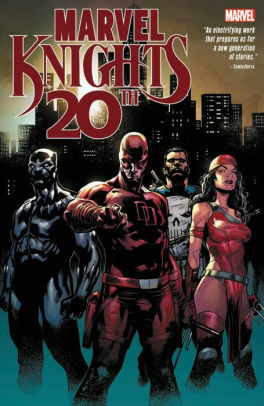 In celebration of the legendary imprint founded two decades ago by Marvel's CCO Joe Quesada, a new crop of talented creators stand poised to tell a groundbreaking story in the hard-hitting Marvel Knights style! In the cemetery, the blind man does not know who he is, or why he has come to this particular grave. He doesn't know the burly policeman with the wild story who has approached him. Or the strangely intense man who sits in the rear seat of the patrol car, his eyes flashing green. But all that is about to change. Matt Murdock is beginning to remember. In a colorless world without heroes, the spark of light must come from the dark. Together, these individuals face a mystery that can only be unraveled...a threat that can only be challenged...by Knights.